The DRMC is proud to offer a FREE recorder project to local Hills schools due to a generous donation from Mr Jess Exiner in honour of his father Robert's love for the recorder. To raise the profile of the recorder for children and adults. To give young recorder players the opportunity to work with professional recorder play and teacher. To provide students with an experience to prepare, perform and explore new repertoire with their recorder in small and large ensembles. Please read the following reports from the last 5 Recorder Projects. The 4th Robert Exiner Recorder Celebration was held during June and July 2011 with the following schools participating: Monbulk, Kallista and Mt Dandenong Primary. The Recorder Specialist Carolyn McAlister attended each school introducing the pieces for the massed item to the students: Friday Calypso, Calypso and Trinidad Folk Song. Teachers continued to rehearse the students in preparation for the concert. 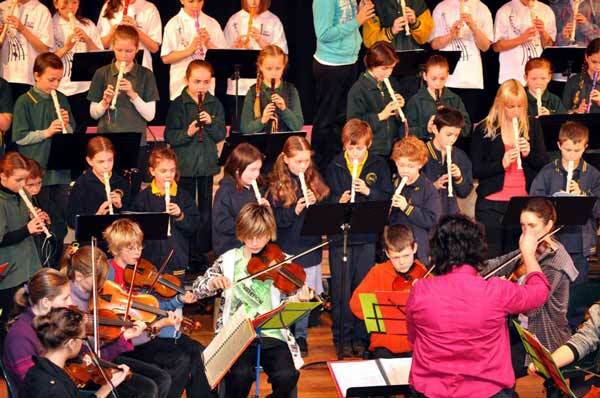 On Sunday 31st July the annual recorder concert was held at Monbulk College Theatre with Mt Dandenong, Monbulk and Kallista Primary Schools performing individual items. A rehearsal was held prior to the concert to ensure students knew where their seats were, where to stand when on stage and run through the massed items. The Cranbourne Salvation Army Recorder Group was invited as special guests and performed a number of items with a variety of recorders including a contrabass. The group was formed in 1993 providing a platform for teaching recorder and playing as an ensemble, a consort and a junior trio. The consort was successful in coming third at the recent Recorder Roomp Competition and hence performed at the Melbourne Recital Centre. Thanks to Colin Smith from the Cranbourne Salvation Army Recorder Band. The Marimba Belles & Beau from Boronia Heights Primary School were invited to perform at the concert as well as back the recorders in the massed items. The Marimba Bells + Beau are a dynamic ensemble of middle school aged percussionists who play concert xylophone, marimbas, vibraphones and glockenspiels. Over the past two decades, the group has performed with great success and acclaim at eisteddfods, on ration and TV. They undertake annual tours of country Victoria Thanks to Adrian Batt from Boronia Heights Primary School. Kate McAlister acted as MC and was able to describe to the audience how the project worked and introduce the performers and items. Kate was also the photographer and Bryce Eble, a former student from Monbulk S.C. was hired to do light and sound. Board members: Felicity Hardiman with her mum and dad operated the box office and Norma Durrand, Chairperson welcomed the audience and opened the concert. Karen Noonan was the Project Manager, Sue Books, teacher from Mt Dandenong Primary School and Michael Mietzcke, Recorder Teacher from Kallista Primary School. The concert ran very smoothly and efficiently. The feedback was very positive and enthusiastic once again and plan are already underway for next year's project and 2012 concert will be held at Burrinja. A huge thank you to Jess Exiner for his financial support and inspiration of this project. Schools participating in last year's recorder project were: Sassafras, Monbulk, Kallista and Mt Dandenong Primary Schools. The Recorder Specialist, Carolyn McAlister chose 2 challenging pieces: The Lady with the Greensleeves and Scotland The Brave and an easier massed item: The Hidden Glade. These pieces were workshopped at each school when Carolyn spent the day visiting the recorder groups and enjoying a day interacting with teachers and students despite the fact she had no voice. On Sunday 1st August the annual Recorder Concert was held at Monbulk College Theatre with Mt Dandenong, Monbulk and Sassafras Primary School performing. Unfortunately Kallista was unable to participate in this year's Concert but are looking forward to being involved next year. A rehearsal prior to the concert ensured students knew where their seats were, where to stand when on stage and run through the massed items. The recorder quartet Lyre Winds from Melbourne Uni were again invited as special guests and performed 'O dearest Finalnd, thou art our land' by Pekka Kuusisito and 'Just as you thought it would be' an arrangement of Sinead O'Connor song 'Just as you said it would be' by Fourplay. Members of the quartet this year were Sophie Hoffman, Ryan Williams, Cathleen Rosier and Reidun Turner. To add a different texture to the Concert, it was decided to invite a string group to perform with the recorders. Ranges Young Strings performed 'Star of County Down' (Three Irish Folk Tunes) before joining the Lyre Winds with three works by Handel - Minuet - Fireworks Suite, Ballet - Opera Alceste and Finale - Water Music Suite. The massed item - 'The Hidden Glade' was written by former Ranges Young Strings member Lore Burns and she was able to be in the audience to hear her composition performed. The Hidden Glade'. The combination of 70 descant recorders, the range of recorders played by Lyre Winds and the strings sounded amazing in this simple but beautiful piece. The Concert ran very smoothly and feedback has been very positive and enthusiastic. A huge thank you to Jess Exiner for his financial support and inspiration of this project.